Chas W. Freeman Jr. is one of America's most brilliant and experienced diplomats and an outspoken advocate of diplomacy and other measures short of war to address international problems. 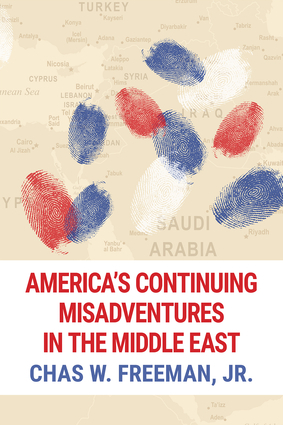 In America's Continuing Misadventures in the Middle East, Freeman builds upon an earlier volume on Washington's Middle East policies to examine the state of U.S. foreign policy in the region since 2010. In this volume, Freeman deploys his deep insight and wit to explore the ongoing ramifications of the Israel-Palestine conflict, the complex consequences of the Arab Spring, and the increasing roles played in the region by China and other powers. He also explores possible policy remedies for the United States' many recent military and diplomatic "misadventures" in the Middle East. Ambassador Chas W. Freeman, Jr. spent three decades as a U.S. diplomat, winding up his government service as Assistant Secretary of Defense for International Security Affairs. He was the principal American interpreter during President Nixon's breakthrough visit to Beijing; served as U.S. Ambassador to Saudi Arabia during Operations Desert Shield and Desert Storm; and designed NATO's transformation into a Europe-wide security system. Since his retirement from government, Freeman has remained actively engaged on five continents and has continued to speak and write widely on issues of international relations and U.S. foreign policy.